Dispensing equipment can be easily integrated with robotics, curing or surface preparation equipment to improve your process. These dispensing systems are examples of such integrations. We would be pleased to help you put together a dispensing system customised for your particular needs. Robots can be easily integrated with dispensing, curing or surface preparation equipment to improve your process. These dispensing systems are examples of such integrations. We would be pleased to help you put together a dispensing system customised for your particular needs. The IDM PP500 pressure pot and IDM HDV-120 valve provide a low cost method of controlled fluid dispensing for low viscosity materials. This automated dispensing and UV light curing system is a set up that integrates syringe dispensing with the precision curing capabilities of the DYMAX Bluewave MX-150 LED UV spot curing lamp and a Fisnar Benchtop Dispensing Robot. This automated dispensing system combines the accuracy and precision of the eco-PEN300 and its ability to dose a shot size as small as 0.001ml with the improved productivity and throughput associated with using a benchtop robot. This volumetric dispensing system uses a preeflow® eco-DUO600 precision mixing and dispensing system to accurately dispense small doses of two-part materials such as epoxies, silicones, polyurethanes and more. This dispensing system is set up for dispensing material from 310ml cartridges. Suitable for volumetrically dispensing RTVs and other single part silicones. 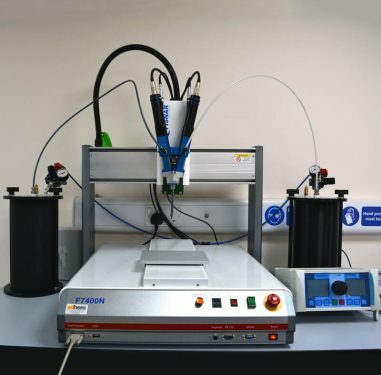 This silicone dispensing system is a set up which features an IJF 790HPNM High Pressure Dispensing Valve mounted onto an FIS F7400N Benchtop Dispensing Robot for the dispensing of material from a 310ml cartridge. This dispensing valve system combines a pressure pot or reservoir fed diaphragm valve with a FIS F7400N Benchtop Dispensing Robot. 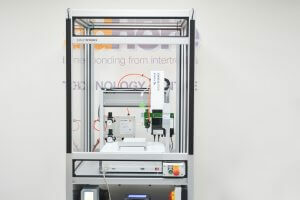 It can be used for automating the dispensing of low to medium viscosity materials such as cyanoacrylates, adhesives, flux, lubricants, solvents, inks and more from a bulk style packaging.